A quick and delicious way to enjoy raw prawns cooked with Chinese influences. Indo-Chinese dishes are extremely popular in India. If using frozen prawns do thaw and drain them well. Both soy and oyster sauces are salty; use salt only if you want to. Heat one tablespoon of the oil in a wok over a medium-high heat. When almost smoking, add the prawns and stir-fry for 1 minutes. Add the wine and increase the heat to high. Cook until the prawns curl up. Remove the prawns immediately from the wok and wipe clean it with kitchen paper. Heat the remaining oil and add the rest of the ingredients except the peppers and cornflour. Increase the heat to high and sir-fry for 2-3 minutes. Add the peppers and stir-fry for 2 minutes. Blend the cornflour with a little water and stir into the vegetables. 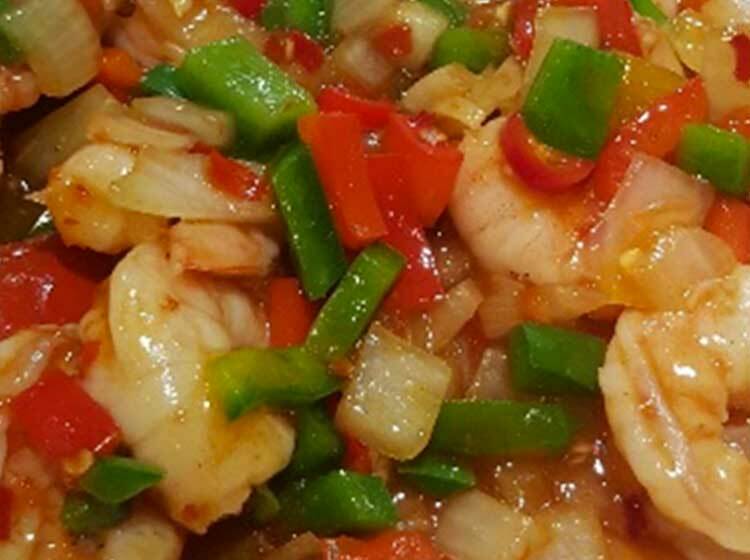 Fold in the prawns, remove from the heat and serve with plain boiled rice.